Twenty years ago, the Wheaton Alumni magazine began a series of articles in which Wheaton faculty told about their thinking, their research, or their favorite books and people. 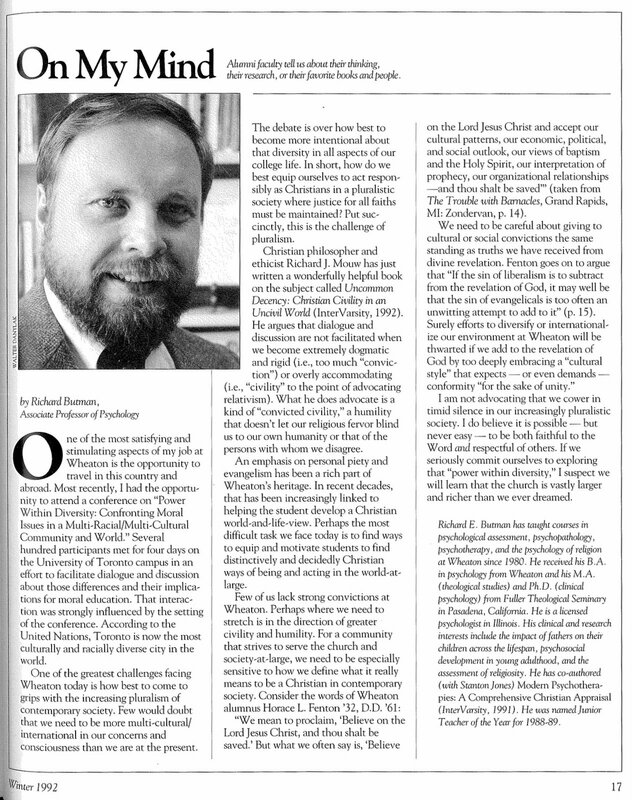 Professor of Psychology Richard Butman was featured in the Winter 1992 issue. One of the most satisfying and stimulating aspects of my job at Wheaton is the opportunity to travel in this country and abroad. Most recently, I had the opportunity to attend a conference on “Power Within Diversity: Confronting Moral Issues in a Multi-Racial/Multi-Cultural Community and World.” Several hundred participants met for four days on the University of Toronto campus in an effort to facilitate dialogue and discussion about those differences and their implications for moral education. That interaction was strongly influenced by the setting of the conference, According to the United Nations, Toronto is now the most culturally and racially diverse city in the world. One of the greatest challenges facing Wheaton today is how best to come to grips with the increasing pluralism of contemporary society. Few would doubt that we need to be more multi-cultural/ international in our concerns and consciousness than we are at the present. The debate is over how best to become more intentional about that diversity in all aspects of our college life. In short, how do we best equip ourselves to act responsibly as Christians in a pluralistic society where justice for all faiths must be maintained? Put succinctly, this is the challenge of pluralism. Christian philosopher and ethicist Richard J. Mouw has just written a wonderfully helpful book on the subject called Uncommon Decency: Christian Civility in an Uncivil World (InterVarsity, 1992). He argues that dialogue and discussion are not facilitated when we become extremely dogmatic and rigid (i.e., too much “conviction”) or overly accommodating (i.e., “civility” to the point of advocating relativism). What he does advocate is a kind of “convicted civility,” a humility that doesn’t let our religious fervor blind us to our own humanity or that of the persons with whom we disagree. An emphasis on personal piety and evangelism has been a rich part of Wheaton’s heritage. In recent decades, that has been increasingly linked to helping the student develop a Christian world-and-life-view. Perhaps the most difficult task we face today is to find ways to equip and motivate students to find distinctively and decidedly Christian ways of being and acting in the world-at-large. “We mean to proclaim, ‘Believe on the Lord Jesus Christ, and thou shalt be saved.’ But what we often say is, ‘Believe on the Lord Jesus Christ and accept our cultural patterns, our economic, political, and social outlook, our views of baptism and the Holy Spirit, our interpretation of prophecy, our organizational relationships –and thou shalt be saved” (taken from The Trouble with Barnacles, Grand Rapids, MI: Zondervan, p. 14). I am not advocating that we cower in timid silence in our increasingly pluralistic society. I do believe it is possible–but never easy–to be both faithful to the Word and respectful of others. If we seriously commit ourselves to exploring that “power within diversity,” I suspect we will learn that the church is vastly larger and richer than we ever dreamed. 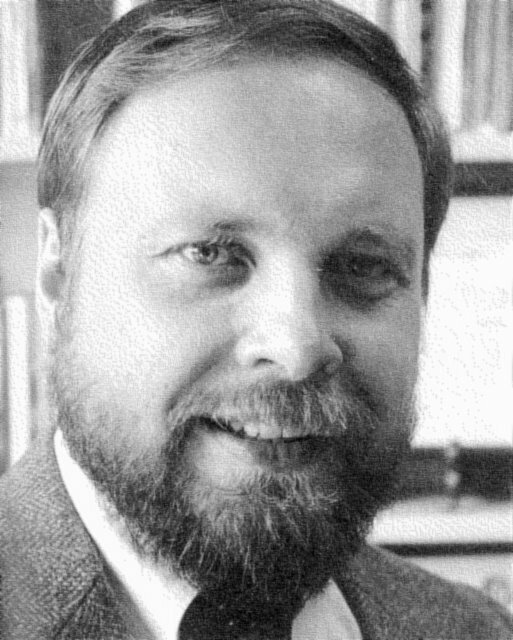 Richard E. Butman has taught courses in psychological assessment, psychopathology, psychotherapy, and the psychology of religion at Wheaton since 1980. He received his B.A. in psychology and his M.A. in theological studies from Wheaton and Ph.D. in clinical psychology from Fuller Theological Seminary in Pasadena, California. He is a licensed psychologist in Illinois. His clinical and research interests include the impact of fathers on their children across the lifespan, psychosocial development in young adulthood, and the assessment of religiosity. He was named Junior Teacher of the Year for 1988-89. His current interests include bereavement and psychopathology. He is currently working on collaborative projects in both areas. His commitment to promoting holistic development has lead to direct involvement in ministries in Africa, Asia, Chicago, and Latin America. Dr. Butman has co-authored (with Stanton L. Jones) Modern Psychotherapies: A Christian Appraisal (InterVarsity,1991) and (with Barrett McRay and Mark Yarhouse) Modern Psychopathologies: A Comprehensive Christian Appraisal (Intervarsity, 2005). A second edition of Modern Psychotherapies: A Christian Appraisal is currently being written with an anticipated release in 2011. Dr. Butman is also involved in a shared project in the areas of integration and the spiritual/sociocultural foundations of mental health.